When done correctly, feedback can help everyone involved grow and develop as professionals. But if not done carefully, it can end up harming a designer’s self-worth. Here’s how to use this tool to your advantage. Have you ever burst into tears or held your head in frustration after receiving especially difficult feedback on a project? If you answered “yes”, we assure you you’re not alone. The thing with working in a creative field is that your projects can really get under your skin. We often end up connecting to our work on a very personal and emotional level. Dreaming about a certain project is not uncommon, and neither is waking up suddenly to jot down an idea, or (in worse cases) even heading to the computer to make a little fix. That is why the subject of design feedback is not something to be taken lightly. When done well, it can massively help to create a positive work environment. Whether you are the one giving the feedback or receiving it, you can strive to make the process a lot more effective, educational and enjoyable for all parties involved. Here’s a guide that will help you master the art of giving and receiving constructive design feedback. Before we begin, keep in mind throughout that design feedback has one major role: to provide useful insights that will enable the design to be better. We know that we’ve reached the right design when it gives users or customers what they need, while achieving business goals. Ever found yourself trying to defend your work, while simultaneously receiving feedback on it? Although you may be a hundred percent sure that you’re right, resist the urge to interrupt when someone is giving you advice. Listen to them with the intent to understand, not to respond. Try to learn the other person’s point of view and understand where their comments are coming from, regardless of your own feelings about it. Simply listening can also eventually lead to a better conversation. Sometimes, finding the right terminology is crucial. By asking for “advice”, as opposed to “critique” or “feedback”, your manager (or whoever is giving you the advice), becomes your helper and not your criticiser. This immediately sets the tone for the discussion and invites a much friendlier and more open conversation, in which both sides are equals and can share their opinions in positive surroundings. Not all design teams have a culture of giving feedback. Whether or not that’s the case in your situation, convince your colleagues that you genuinely want to hear their true thoughts on your work. Don’t accept an environment in which you’re permanently not receiving any feedback. After all, learning from your peers is one of the main benefits of working in a team. If it makes things easier, you can suggest picking a different venue to hold your meeting in, making it more relaxed. Talking about your design project, while getting a coffee or taking a little stroll doesn’t sound so bad, does it? We each have our own methods for this, but remember to give yourself time to pause or take a sip of water if needed. And also don’t forget to breathe from time to time. These practices will help take your immediate defensive reaction down a few notches, potentially dodging a crying-in-front-of-your-manager situation. The likelihoods are that you’ll leave any major design review with anywhere from ten to 50 things to look at. And not only are you not some kind of superhero designer that can speedily solve all of those issues, you also needn’t be. A much more effective way of working is to prioritize the things that truly matter and compromise on the rest. Have the self-confidence to decide whether certain comments need to be addressed urgently, or whether they need to be addressed at all. Consider the fact that some of the feedback you’ve been given may be more relevant at a later stage in the process. As the designer working on the project, you have the knowledge and expertise to decide that. …Without using the “sandwich” technique. This once popular method (in which you sugarcoat the negative comments with positive ones before and after) can often seem insincere. People are generally aware of it and tend to only take in the negative feedback, ignoring the positive. You can always find something good to say. Perhaps there’s a certain element that was executed well that you think could be applied somewhere else, or you can appreciate the thinking behind the work. As already mentioned, you’re here to help the person in front of you, not put them down. Your feedback should help set them in the right direction or shed light on a different angle they could take. Find the right terminology that will make your reasoning clear, while not necessarily giving one single solution. For example, “When you place the fields side by side, users might miss the second field in the mobile version of the website.” Also, try to be empathetic and properly understand why the person is stuck, or why they made these decisions. By doing this, you will gain two things: firstly, you’ll get a better understanding of the task at hand, and secondly, you’ll encourage your peer to organize their thoughts and explain their decisions. Hear about your colleague’s work process, how they made decisions, what they would change if they could and more. Start from the bigger questions, for example “what’s the user’s journey before arriving to the screen, poster or product?” and “what’s the primary goal of the design?” Get gradually more specific, asking questions such as “why did you choose to put more focus on this part of the product?” and “what were you trying to achieve by designing this button in a different way than the others?” This process can also lead to a more open and interesting discussion, which in turn can even spark more ideas. As a feedback-giver, your task is not to give concrete solutions. That probably won’t benefit the designer too much in the future. 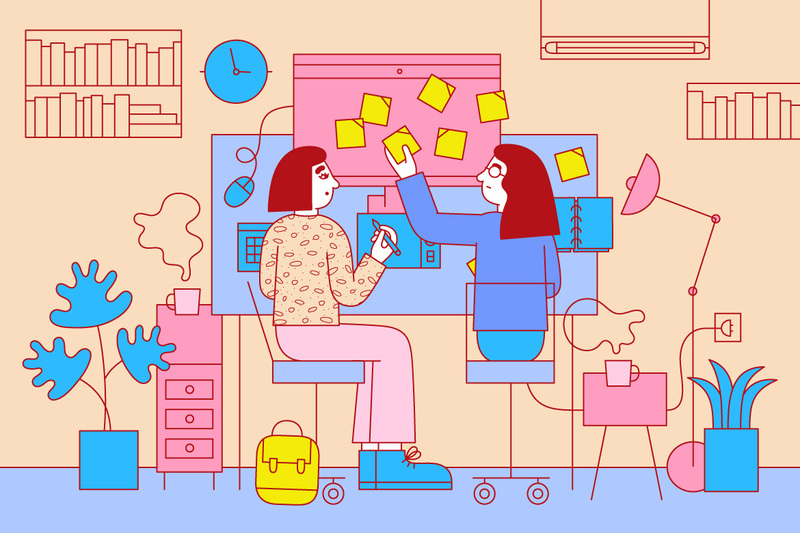 By giving suggestions and helping your colleague choose the right path for the solution, you’re helping them develop their skills and learn how to utilize these methods in the following sessions, or when they next hit an issue they have to deal with. Of course, there are times in which the designer may ask for your personal preferences (“are you more into the peach or the salmon shade for the background?”) and in that case, you can express your opinion. Have faith in the people you work with. You don’t want your co-workers to feel like they’re being babysat and having their every move watched and double-checked by their manager. Instead, believe in them, and in turn, this will help them believe in themselves and flourish as designers. It really is a win win situation and generates a much funner environment to work in. Lastly, another excellent exercise is to practice giving and receiving feedback in a loving, caring environment. This could be with a friend, family member, or possibly even your cat. This will help you face any concerns you have, build your confidence, and ultimately prepare you for the real thing.